Spaniard Ernesto Valverde took over the reins at Barcelona in the summer of 2017, replacing the outgoing Luis Enrique. In a 16-year coaching career, the 54-year-old has garnered experience in both Spain and Greece, with successful spells at Espanyol, Athletic Bilbao and in particular at Olympiakos, where he won three Greek Superleagues. Also a former Barcelona player, Valverde won the European Cup Winners’ Cup and Copa del Rey under the management of the great Johann Cruyff. Although Valverde (below) began life as Barcelona’s head coach with a Spanish Super Cup defeat to rivals Real Madrid, he then led his new club to a 29-match unbeaten run, which was eventually ended by local rivals Espanyol in the Copa del Rey. Despite crashing out to Roma in the last eight of the Champions League, Barcelona lost only league game all season – that a crazy 5-4 classic to Levante – on their way to a domestic double. Valverde alternated between a 4-4-2 and Barcelona’s traditional 4-3-3 structure during his first season. After the departure of Neymar to PSG, and perhaps not blessed with a vast number of wide attacking options, Valverde used the 4-4-2 to create defensive stability when out of possession. This could also allow star man Lionel Messi to remain in central positions when attacking. In his team’s early La Liga matches this season, Valverde has seemingly moved back to a 4-3-3 structure, with Lionel Messi, Luis Suarez and Ousmane Dembele forming a formidable attacking trio. Sergi Roberto has been briefly moved into a central midfield role, but with the returns of Ivan Rakitic and Philippe Coutinho to full fitness after their prolonged World Cup campaigns, it is expected that he will battle it out with Nelson Semedo for the right-back role. The rest of Barcelona’s back line picks itself, with Gerard Pique, Samuel Umtiti, Jordi Alba and Sergio Busquets in front of them offering great defensive quality both as individuals and as a unit. Further forward, Coutinho has proven an excellent heir to club legend Andres Iniesta in the inside channel. The Brazilian’s skill on the ball in tight areas, and his link-up play with Messi, is a focal point of Barcelona’s central attacks. In their upcoming Champions League clash against Tottenham, Barcelona may find themselves attacking a defensive back five. With the majority of La Liga teams setting up with a back four, Barcelona have been known to stutter against such a defensive formation. 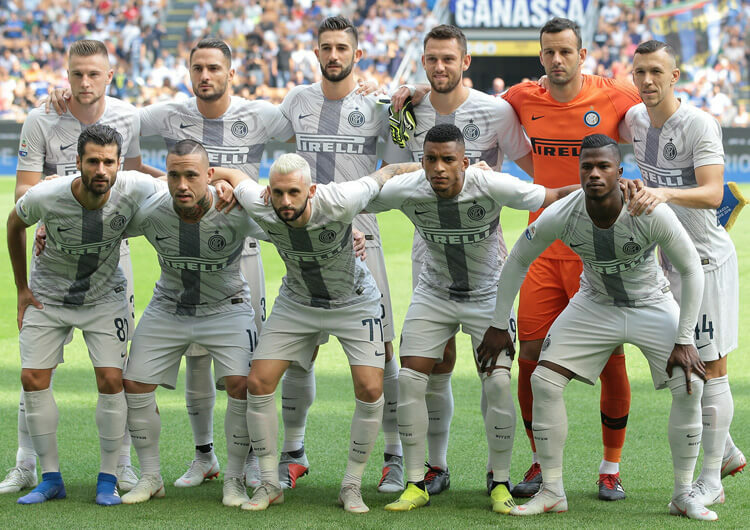 Their last outing against a back five, in fact, was against Roma in last season’s Champions League quarter finals – and we all know how that ended. Messi in particular may find his inside movements more difficult, as an extra central defender can congest the central lane (above, right), providing less space for the Argentine to receive and combine in front of goal. Where to start? 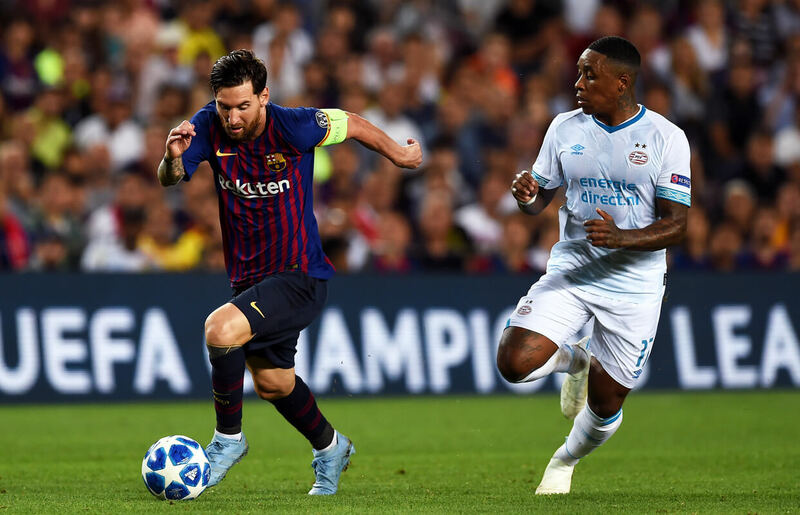 Barca have stuttered after winning their opening four La Liga games of the season, scoring 14 goals in the process, but they had few problems in their opening Champions League win over PSV Eindhoven. The front three of Messi, Suarez, and Dembele are all individually capable of beating multiple players in tight areas, and can all finish chances from various angles and positions within the final third. With Rakitic and Coutinho also effective strikers of the ball, Barcelona have midfielders who can grab crucial goals from distance, as well as providing runs forward to penetrate (below), should the main trio of forwards be unable to access the opponents’ goal. One particularly impressive move that Barcelona have mastered over the years is the ability to create cut-back crosses from full-backs, with an unmarked forward inside the penalty area ready to simply tap home. This originally comes from the positioning of the front three, who occupy the entire opposing back line. The two advanced central midfielders also look to occupy the spaces between two opposing midfielders. From here, Barcelona’s full-backs can sneak around the side, as they make use of their wider starting positions. One of the forwards – usually the furthest from the ball – crucially begins behind the opposition defence, and in an offside position (below). So, once the ball is played in behind for the full-back, the forward in on goal has a positional advantage over his nearest centre-backs – allowing for a straightforward finish if the cut-back is accurate. Barca’s ability to dribble from midfield areas also helps lure opponents out of shape, and create gaps through which their ballplayers can then pass – this is another effective way of bringing their offensively minded full-backs into play. Even against an incredibly compact low block, the likes of Messi, Dembele and Coutinho, all of whom can dribble or pass their way out of extreme pressure, can create chances for themselves or teammates alike. 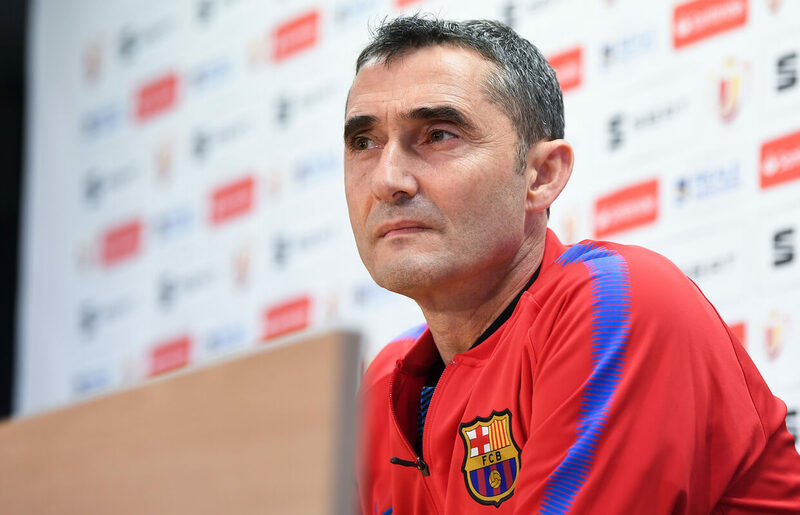 Valverde’s decision to move back to a 4-3-3 structure may have a negative impact on their defensive displays. In last season’s 4-4-2, both full-backs had additional protection in front of them, and were therefore less exposed when defending in wide areas (below). Valverde instructed his overlapping full-backs to immediately recover back into defensive shape, with his midfielders dropping back to cover the spaces in front of them. The 4-4-2 structure also provides the best coverage of the pitch when out of possession. Compare this to a 4-3-3 formation, in which the wide attackers have further to recover in which to form a midfield block of five. It is unrealistic to expect them to consistently recover back into their own defensive third, particularly within a team as attack-minded as Barcelona. From here, Barcelona have looked vulnerable when defending crosses, as the full-backs are unable to stop deliveries into the penalty area (above). With the likes of Messi, Dembele and Malcom not providing defensive support, Alba, Sergi Roberto and Semedo often have large spaces to defend. When up against a fast and direct winger – particularly one whose stronger foot is on the outside – Barca do look vulnerable. The central defence will also struggle against supporting runs from midfield, as Rakitic, Coutinho and even Busquets can lose their men while recovering back into their defensive third. The undisputed king of Barcelona, Messi’s progression through the famed La Masia youth academy into the first team, and eventually into the club’s greatest ever player, is a fable often told. The diminutive Argentinian has scored more than twice as many goals for Barca as any other player in the club’s history, with no fewer than 48 hat-tricks contributing to a total that has long gone past 500. He is one of only two players – the other being Cristiano Ronaldo, of course – to have scored more than 100 goals in the Champions League. Under Valverde, Messi has often been used as a central forward, accompanying Suarez at the tip of a 4-4-2 structure (below). This position allows Messi to roam within the central lane, often receiving between opponents’ lines, from where he can create or finish attacks. Historically, forward runs from attacking midfielders such as Iniesta pushed back opposing defences, forcing midfielders into deeper recovery runs than they would normally make. With Coutinho now fulfilling the exact same role in the wake of his January move from Liverpool, this works to create even more central space for Messi. Additionally, the Barca full-backs often pin back their opposite numbers, who subsequently can’t move inside to create a defensive overload as Messi receives the ball. When used in a 4-3-3, Messi is moved to the right side of the front line, where he will drift and roam more frequently. As a right winger, Messi’s diagonal passes and through balls come into play more, as he looks to play disguised passes for runners from Barcelona’s left side to penetrate in behind. With Messi drifting infield, even more space is created for Sergi Roberto to move forward and provide crosses from deep on the right side. One notable difference for Messi when used on the right of a front three is his receiving patterns. Most of his touches and passes from this position will arrive in front of the midfield (above), once he’s drifted infield. Compare this to when used as a central attacker, when he will usually receive behind the midfield or even defence, when running on to a through ball or when completing one of his famously rapid one-two combinations. No matter what position Messi plays within this Barcelona side, however, it will take at least two or three defenders to stop him. Even then, that may not be enough. 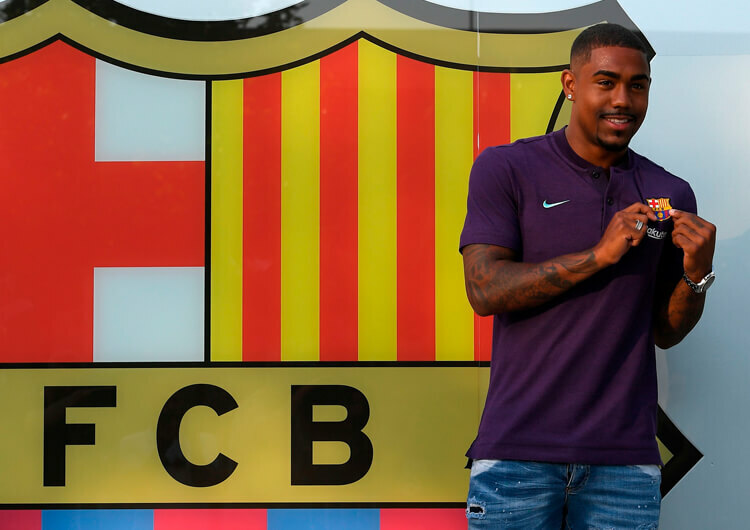 Paul Pogba may yet become the biggest signing of the summer by Barcelona, but perhaps the most exciting is the young Brazilian attacker Malcom – but how will the €41m recruit line up alongside Lionel Messi, Luis Suarez and co?